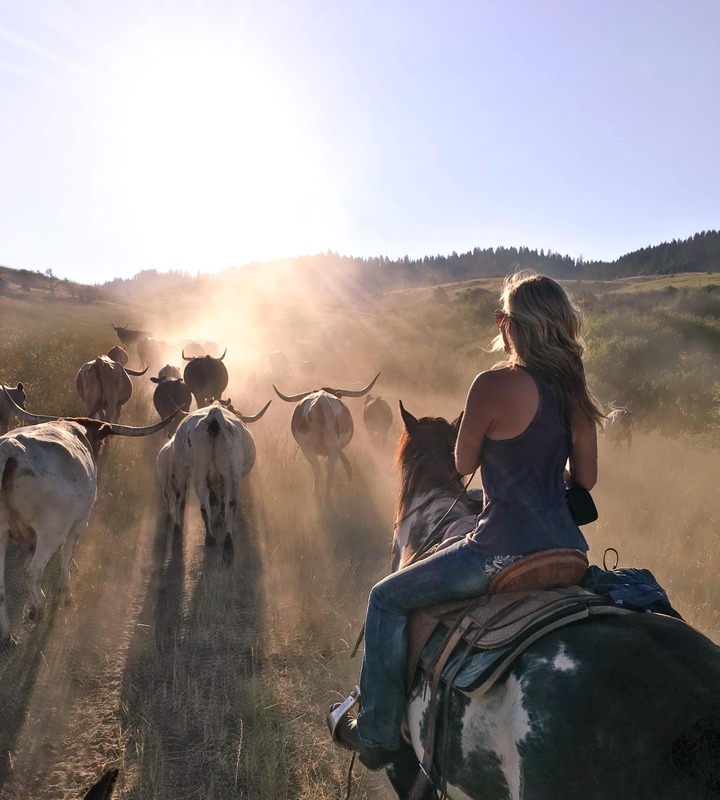 In an effort to retreat from the world, I had planned my visit to 4D Longhorn Guest Ranch on the heels of a four-day stint in the constantly congested city of San Francisco. The stress of travel and the chaos of the city (although beautiful), left me consumed by a longing for solitude. 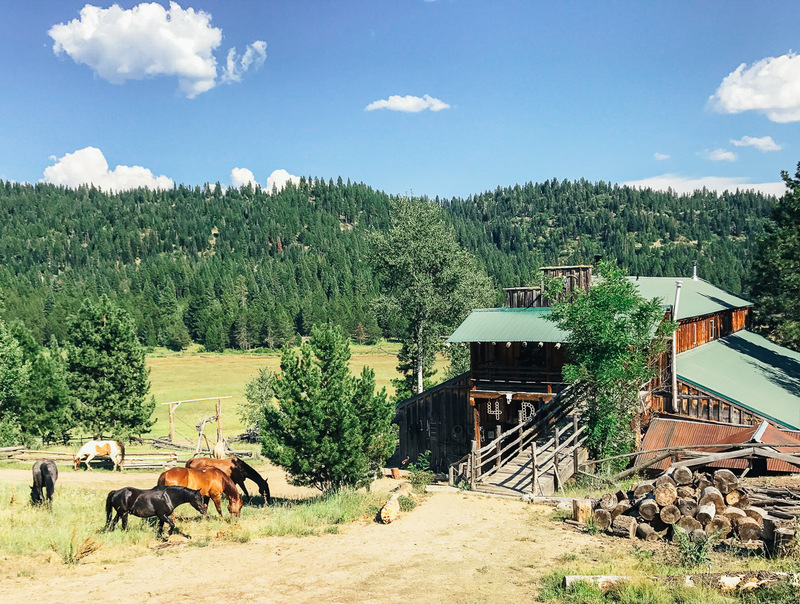 I found myself wanderlusting over wide open spaces, pining for remote places and gripped by the desire to be where there is more “nothing” than “something.” My guest ranch getaway proved to be the perfect solution. 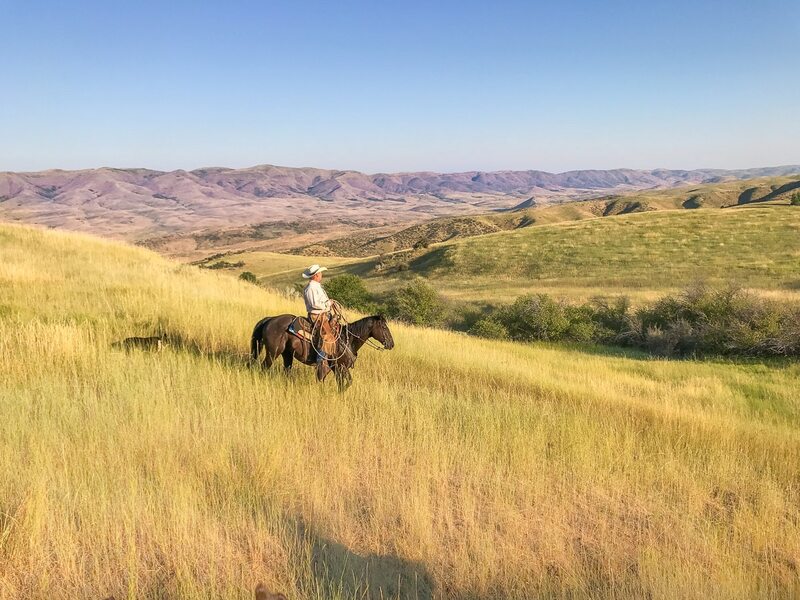 Home to 40 horses, 3 people and 211 acres of breathtakingly gorgeous scenery, 4D Ranch is an unpretentious paradise where western charm meets wild frontier. It’s a wonderland of wide-open spaces, a utopia of unspoiled landscape and a heaven for horse enthusiasts (and for the not-so-equine-enthusiastic as well). Here, country life endures and cowboy culture remains, perfectly preserved and open to visitors. If you’re looking for somewhere to disengage from our fast-paced, ever-changing world, 4D Longhorn Guest Ranch is the place. Though 4D Longhorn Guest Ranch isn’t far from Boise (about 60 miles) it feels worlds, if not decades, away. All signs of society (and the subsequent stresses they induce) were left in a literal cloud of dust as I turned off the highway and descended the dirt road towards the ranch. From the moment I set cowgirl-boot-clad-foot on the property, I was in love. 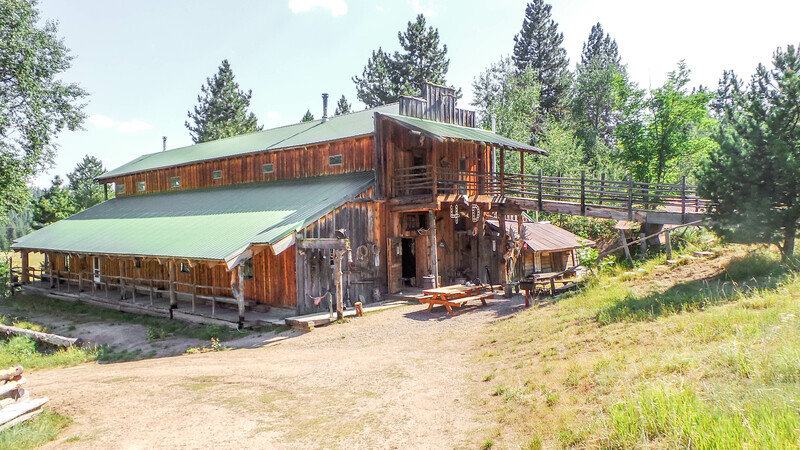 Nestled in a high country meadow amid stunning mountain scenery, the guest ranch consists of 5-6 individual cabins that surround a large, main lodge. The layout resembles an old western town and the rustic style of each structure contributes to the traditional cowboy ambiance. The main lodge is the physical and metaphorical center of the ranch. It’s where meals are shared, downtime is spent, games are played and friends are made. Inside the lodge, the atmosphere is rustic, warm and inviting. To me, it immediately felt like an outpost of tranquility and comfort (and not just because that’s where meals are served). 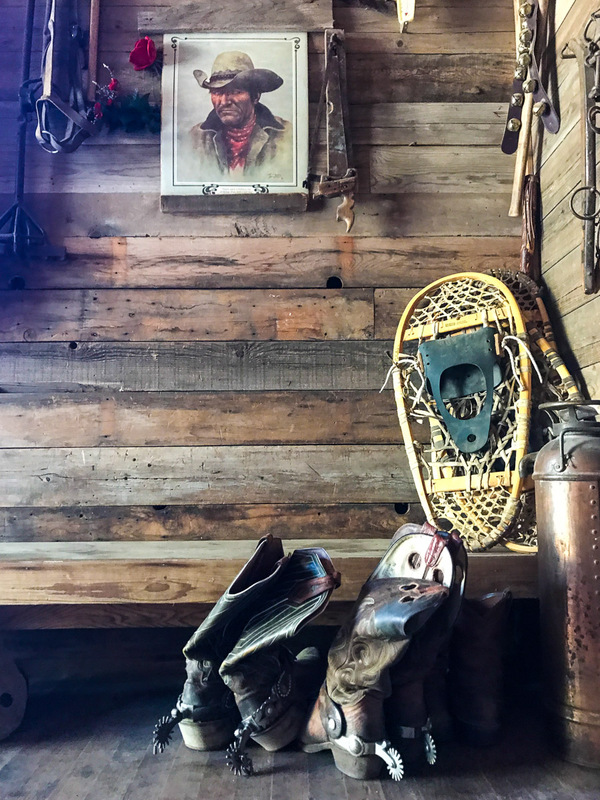 Dimly lit, yet vibrantly decorated, the lodge’s living room decor pays homage to cowboy culture and every inch of wall space is adorned with a variety of photos and trinkets. From western art and artifacts to old pictures and rodeo flyers, the score of cowboy decor evokes an old western museum — a rabbit hole in which I spent a sufficient amount of time getting lost. In the center of the lodge an impressive collection of cowboy boots (in all shapes and sizes) surround the staircase, while old saddles line hallway beams and chaps hang from overhead lentils. If cowboy culture were contagious, you would definitely catch the bug by spending time inside the 4D lodge. The cabins that surround the lodge vary in size and each has its own unique look (both inside and outside). 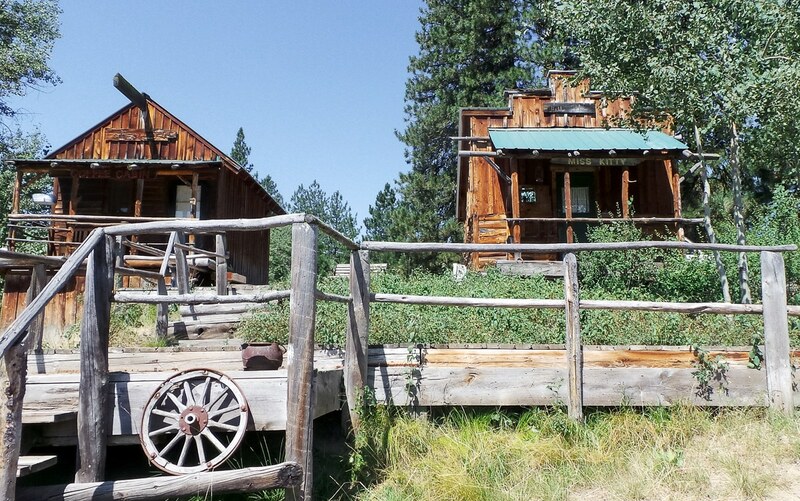 Each cabin boasts a private front porch that offers amazing views of the lodge and surrounding meadow. Some cabins contain a private bathroom, while others use the nearby bath house, which is very large (it contains five private stalls) and clean. Brad Ford is the man behind 4D Longhorn Guest Ranch. Beyond being the owner, creator, builder, trainer and host, Brad is the heart and soul of the ranch. 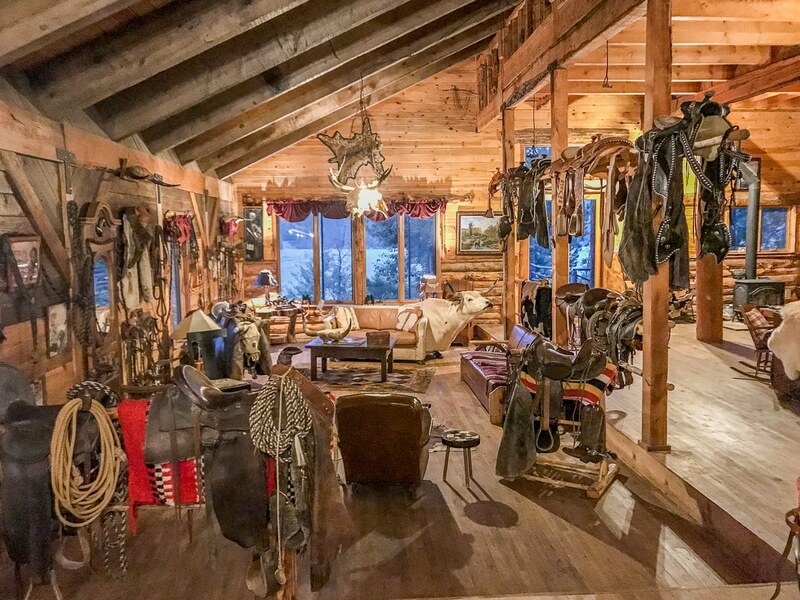 His passion for horses and the cowboy lifestyle is reflected in every element of his guest ranch — from the decor to the hospitality. To guests, 4D Longhorn Guest Ranch is a vacation, but to Brad the ranch is his life. He so much loved the lifestyle that he opened his life to visitors. “I wanted to invite people into my world and give them a taste of ranch of life. When you visit, you’re literally stepping into my life and experiencing it as I do.” Brad said. “And, if you don’t like it, you can step right back out.” He added with a laugh. However, it’s evident that Brad wants you to enjoy your experience. An amazing host, Brad is very accommodating and creates the itinerary around his visitors, rather than having a set one already in place. 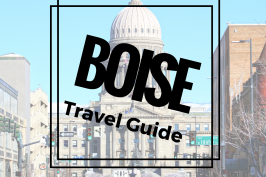 Visitors are able to take things at their own pace and enjoy the beautiful setting in whichever way they desire, be it horseback riding, hiking, yard games, or just relaxing with a book. What I like about Brad (besides his amazing hospitality, sense of humor, outgoing nature, and obvious passion) is that he’s a horseman first. 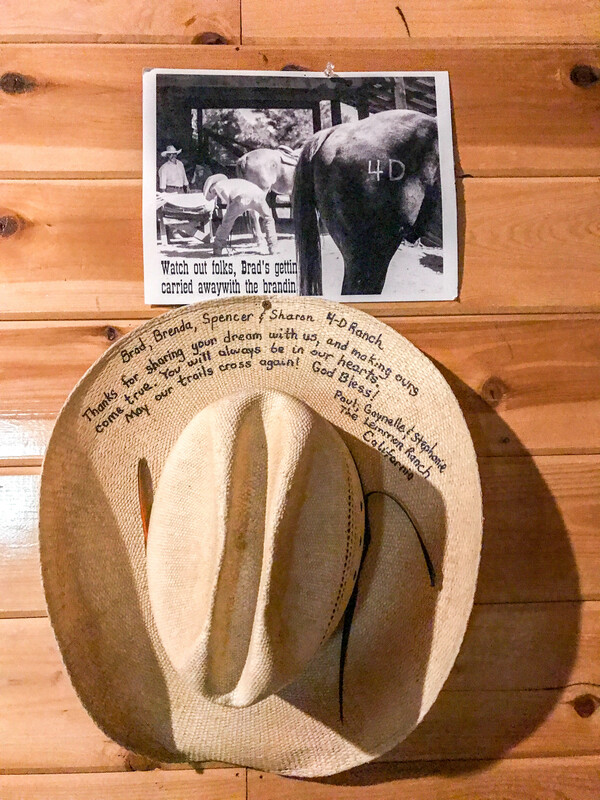 The ranch’s cowboy experience and western decor isn’t a front to attract tourists, it’s fundamentally who brad is — it’s not a facade, it’s his real life. 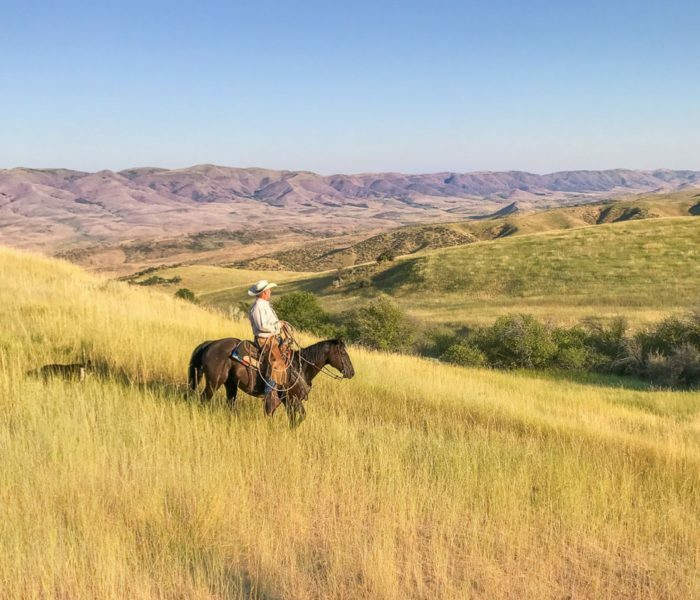 This level of authenticity creates an unparalleled guest ranch experience that you’ll be hard pressed to find anywhere else. A herd of horses jet past me in a cloud of dust as I position myself as a human road block in an attempt to deter any rogue members from venturing off-course. 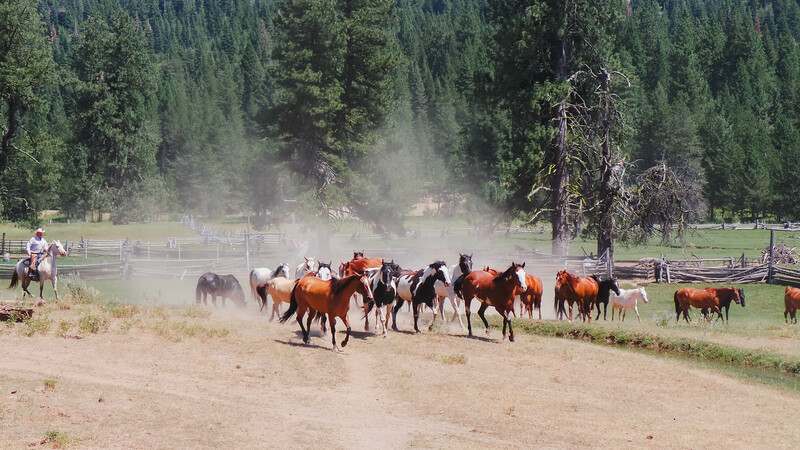 We are supposed to be herding the horses back to the corral, but — since none of us “herders” seem to know where the corral is — the result is a flurry of 40 horses running in circles around the 4D lodge like a real-life merry-go-round. The ensuing chaos (though semi-controlled) is a stark contrast from the peace and tranquility that presided over the ranch moments earlier, as the setting sun illuminated a postcard-perfect scene of horses grazing serenely around the 4D lodge. Now the pounding of 160 hooves reverberates off the nearby cabin walls and my mason jar of iced tea (from which I was so recently sipping amid the idyllic evening setting) is shaken to the ground from its picnic table perch. Similarly I’m shaken from my romanticized country daydream to the realities of ranch life and the work required to make it run seamlessly. This, to me, is the draw for dude ranches. When you visit 4D Longhorn Guest Ranch, you’re not getting a carefully designed, cookie-cutter, pre-planned experience. You’re getting a taste of real ranch life. You get the opportunity to step into someone else’s shoes — or boots — and experience a different way of living. The subsequent thrilling, relaxing and eye-opening encounter is fundamentally why we travel in the first place. Whether said travel is motivated by relaxation, adventure, or education, 4D Ranch provides all of the above. Moreover, at 4D Longhorn Guest Ranch you can choose how to spend your vacation (no set itineraries here!). 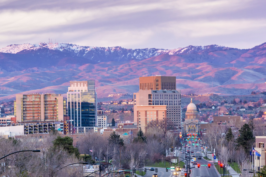 Whether you’re getaway involves riding, rafting, or relaxing, it’s all up to you. For me, the answer was definitely riding; and I got in some serious saddle time during my two-day visit. 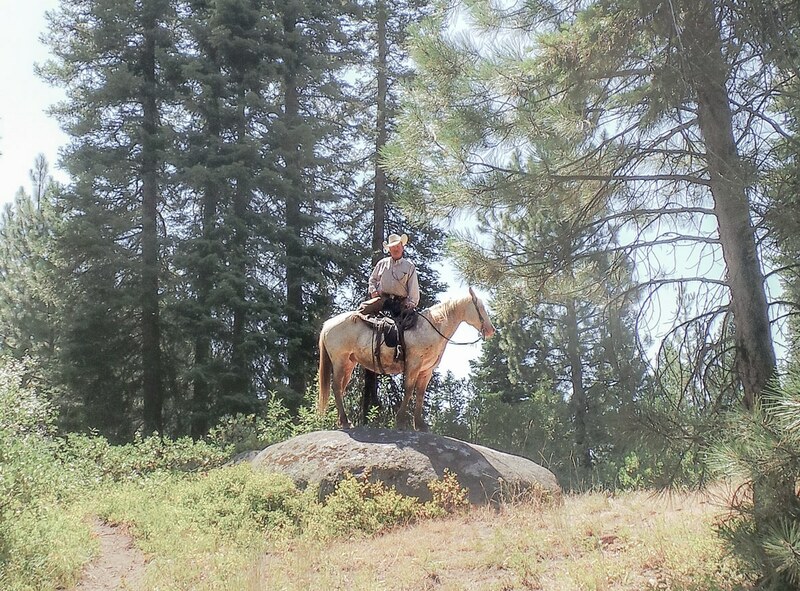 The first day, we embarked on a trail ride through the surrounding national forrest. Based on past experience, I had expected this group trail ride to be a robotic “nose to tail” parade along a perfectly groomed, fairly flat (and somewhat boring) trail. However, that’s exactly what this ride wasn’t. Emphasizing more “ride” and less “trail” this was more like off-road, extreme trail riding. We rode up and down hills as well as through bushes, water, and meadows. The ride was entertaining for an experienced rider, like myself, yet still safe and comfortable for a green rider (like my boyfriend). All the while, the stunning mountain, forrest and meadow scenery provided a breathtaking backdrop. Though the trail ride was beautiful, the highlight of my visit was definitely the next day’s cattle drive. You know that HBO Show, Westworld, in which guests pay to visit the old west and get a taste of life on the wild frontier? A visit to 4D Longhorn Guest Ranch is kind of like that — save for the gunfights and robots. I know it’s a crappy analogy, but words cannot describe the feeling one gets while riding horses through the open hills, chasing longhorn cows. It’s serene, yet stimulating. It’s wild, rugged, and as cowboy as can be. It’s freedom and country as it’s meant to be experienced. By the time we were finished my skin and clothes were covered in dirt and dust, my hair was ratted from the wind, my tail bone was sore, and my eyes and heart were shining. I couldn’t wipe the stupid grin off my dirty face and I spent the entire drive home on Cloud 9. My stay at 4D Longhorn Guest Ranch was definitely one for the books and an experience I won’t soon forget. I will definitely be back, and I look forward to the day when I return. Conclusion: Ranch Life is Awesome! All meals are included. However, any adult beverages are BYOB. Vegetarian meal options are available if you let them know ahead of time. Some accommodations include a restroom in the cabin, while others use a shared restroom. The bath house (shared restroom) has a men and women’s building. Both include showers and are very large and clean. If you’re looking to buy an amazingly trained horse, talk to Brad (the ranch owner). As I mentioned in the article, Brad is a skilled horse trainer and (almost) all the horses at 4D are available. So if you fall in love with your horse, or you’re just looking to buy an extremely well-broke horse, come check out the great horses at 4D. We were guests at 4D Longhorn Guest Ranch but, as always, all opinions are my own. This looks so fun and dreamy! 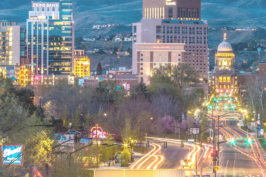 Life out west is the best life..
Oh my gosh, I’m reading this and thinking how this is 100% the trip I need right now. Luke’s not a horseman by any stretch, but I’ll take any excuse to pet/ride/love on a horse. This looks like an amazing experience, and your writing style just transported me right there. Thank you for sharing! Amazing post. Some of the photos are simply breathtaking. This looks like an amazing place to get away! This reminds me so much of Westworld! I absolutely need to go here now. Wow! This looks like the PERFECT getaway when things are too crazy at home in the city. This is totally going on my must-see list! Looks like you had a great time! The pictures are beautiful. 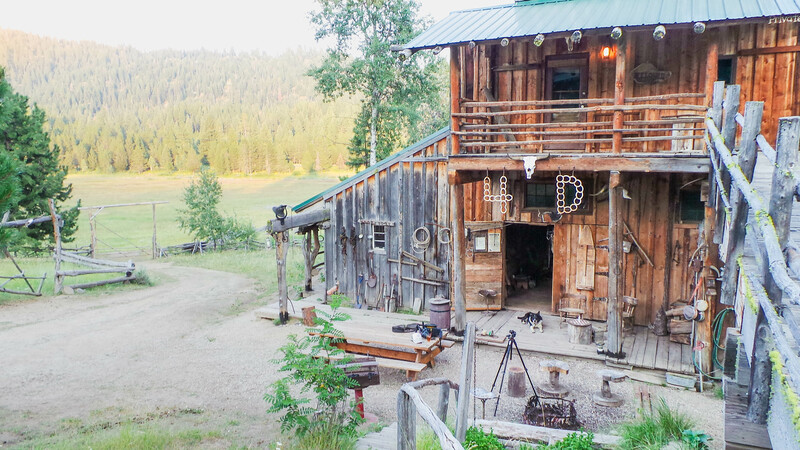 A guest ranch looks like such a unique type of travel experience! Sounds like you had a great time. Quick question though: was this post sponsored by 4D Longhorn? Your photos are absolutely stunning! When I see photos of ranches like this, I often wonder what it would be like to live as a cowboy back in the day. I live in the UK so I’ve never seen anything like this with my own eyes, but it looks awesome! What a perfect place for a relaxing getaway, too – it seems really serene and very different to city life (which is sometimes exactly what I’m looking for). I’ve always wanted to go horse riding, too, so it’d be a total win-win! Wow, that’s the first time i read about a getaway in a ranch!! Well written and inviting. The scenery seems perfect for a movie set. I have a strong feeling you’ll go back. Your writing (and your photography) have captured the utter tranquillity of the ranch and its surrounding scenery so beautifully. I can definitely relate to needing a mental break from the busy pace of an urban life once in a while and I think wide open spaces are the perfect antidote. The only time I visited a Ranch was when I was living in Houston and I attended a party there at a ranch. Your description of ranch makes me want to go back. Best part is that you talk about vegetarian food being available – that is such a big relief. Wow. For a non-American like me, this is exactly the picture I have in mind of the American countryside. Your pictures are beautiful. I can imagine spending a weekend at 4D Longhorn Guest Ranch and trying my hand at being a “cowboy”. Omigosh, this looks like an amazing getaway! I haven’t watched Westworld, but this immediately made me think of City Slickers. Pretty cool that you found the wild blueberries, too! I’d definitely enjoy going to a ranch someday since it’s not something very common here around Europe! Very nicely done, it seems that your time at 4D Longhorn was really relaxing and a good break from the city! What a great article and pictures. Perfectly captured! I’ve spent a great deal of time at this ranch and with Brad. I even bought a horse from him! Knowing Brad, kthis place filled and my new pony filled a hole in my heart I didn’t even know existed. If you are ready for dose of peace, slice of heaven and an experience of otherworldly joy, 4D Longhorn Ranch may be calling to you! Brad is one of the most amazing men I’v had the privilege of knowing! Be there, done that, didn’t buy a t- shirt but got the photos to prove it, many times. Don’t delay and talk about it Go!